"I understand the value of engaging in conversations online with our customers. In fact, I know the conversations are going to happen anyways and our only real choice is whether we’ll join in or not. But how can I convince my boss this is the right decision?" I recommended she share a few chapters of Groundswell with the members of her senior management team that were reluctant to engage in social technologies. Forrester Research analysts Charlene Li and Josh Bernoff wrote this excellent guidebook to thinking about the Internet-enabled social marketing as an opportunity, not a threat. "Right now," they warn, "your customers are writing about your products on blogs and recutting your commercials on YouTube. They're defining you on Wikipedia and ganging up on you in social networking sites like Facebook." Scary stuff. Or is it?The authors spend the first sections of the book describing this technology-enabled groundswell. It exists. And it is creating opportunities for some businesses and threatening others. Li and Bernoff use over 65 specific examples. For example, journalism professor Jeff Jarvis’s blog posts about “Dell Hell” led to a wave of unfavorable publicity on Dell customer service and led Michael Dell to personally oversee a revamped online marketing strategy. He implemented an internal community, IdeaStorm, to generate innovate ideas within the company, he encouraged engagement with Dell's community of customers, and he advocated authenticity in company communications. In many ways, Dell was pulled into the groundswell unwillingly, but now social and online marketing are a critical element of its marketing strategy. Obviously, this isn't new content, but it is framed with the CEO in mind and it focuses on the questions the C-suite likely have. Start small. "The change will take time…. So pick your battles strategically." Educate your executives. Use data to show them this isn’t just for their kids. Pick the right team. Recruit people who use the word “customer” often. Get agency and technology partners in sync. Social marketing changes the paradigm. Instead of broadcasting a message, you build customer relationships. This book helps managers see this transformation unfolding through examples they may see as analogies to their own market position. 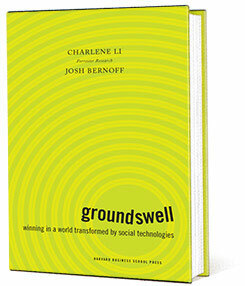 Groundswell also explores how tools like wikis, employee social networks, or crowdsourcing can be utilized. It concludes that these tools have potential to enable innovation, but that ultimately "culture and relationships trump technology." Success requires aligning management, employees, agencies, and technology vendors together around embracing the way the groundswell shapes marketing strategy. While the book presents useful data, it is not a rigorous assessment of the space. It doesn't offer a compelling high-level framework that helps senior managers "get it." What it does do is delineate time and time again how Facebook or Twitter or Blogs are presenting new challenges for organizations -- challenges that managers should ignore at their own peril.